How do you pronounce Bomg? I've spent the past several hours walking around and muttering the word quietly over and over and people were looking at me with furrows of worry caked on their faces. This one has frazzled my brain, it does not compute, I fail at saying a word that looks so simple to pronounce but the synapses misfire and pop in tiny puffs of smoke when my mouth forms the necessary shape in which to say the word and so I say it over and over like a mantra; or I'm stuck in an OCD nightmare. With that in mind I sit down to listen to Bomg's follow up EP to April's "Plutonaut", captivated as I am by the cover artwork and realizing that it looks a bit like where I live. Rolling green hills and shrooms on logs, yup. We've got all that stuff here. So I decided to go for a walk and listen to Bomg's "Polysneeds", instead of sitting at home muttering to myself and nodding my head back and forth and glaring at the carpet. I take a stroll through a nearby woods, toking as I go and as the opening chords of "Intro" flood my ears with galaxy shaking doom, I realize I made a good choice. I just wish I had a big grey beard, a long woolen hooded cloak and a trusty oaken staff...or something. Feedback moves into the Sleepy stoner riff of "Polysneeds of Shubin", the stoner caravan is launched into a journey through psychedelic doom blending huge megalithic riffs, heavy lumbering drums, and spacey smokey lyrics. The waves of lowend are piled upon you and catch you in a trance; this is hypnotic, even shamanic doom of a most ancient kind played by oath taken high priests of the riff. The trees move gently around me but I can almost feel the ground shake under my feet, even though I listen through headphones, the sonic weight sinks through me into the ground, shaking it as I walk and nearly bringing me to my knees once or thrice. I continue apace as the massive chugging fuzz of "Etaph" shoots waves of earthy yet cosmic doom down my spine. Soaring and drifting vocals sound a ritual chant as the riff is carved onto a moss covered stone, ancient spirits look on with folded arms, nodding their ghostly heads in riff approval. Pan's pipes sing a luring tune halfway until the airy chant returns to herald the falling of the sky as splitting guitar licks and thick fuzz crushes all but herein is celebration as the pace picks up into a hugely satisfying stoner rock blaze out, complete with double fist and long hair raising moments of metal obliteration. A drone of feedback leads to "Etaph pt.2" and Bomg turning on the sludge hose and dowsing another transcendental doom journey with thick slatherings of fuzz. Earth shaking drums evoke ethereal guitar movements creating a spacescape that you float through in your mind's eye until you are snapped out of your vision into a torrent of psychedelic and soul stirring doom with such a simple but memorable guitar lick which brings to mind Warhorse and their brilliant and ultra heavy output all those years ago. "Sanikov Land" takes us on our final journey through Bomg's crushing psychedelic doom, the expertly crafted riffs on full display driven along by a rumble of ground shaking drums while chanted calls echo through inner and outer space making Bomg a band that plays some of the most hypnotic doom I have heard in a long time. 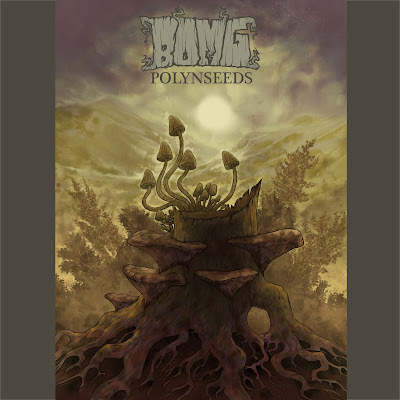 However you pronounce their name, it seems that Bomg don't have a facebook but this absolutely mind blasting doom album can be previewed and then bought at their Bandcamp. I urge you to do both. Classic description Al, who wouldn't want to "turn on, tune in and drop out" to that amazing music after reading your review. You may think it's green talking, but seriously, there has got to be someplace you can sell your high quality writing. I have already bookmarked your site and look forward to more.